Jaguar had flipped the sports car world upside-down in 1948 with the introduction of the 3.5-liter XK120 roadster. William Lyons did the same thing to the Grand Touring niche in 1950, when the huge Mark VII sedan received recognition at the Earls Court Motor Show; the car was a six-passenger sedan with walnut-and-leather comfort and the finish of a Bentley, but powered by the same Jaguar XK120 engine and capable of reaching 100 mph. Most amazingly, the Mark VII sold for £988 — the same price as the XK120 — and avoided the punitive purchase tax that kicked in at £1,000. Like the XK120, it had torsion bar front suspension, but also featured power brakes, a radio and heater — all included in the price. The car was a hit in England, with the company arranging special trains so that workers could come and see the car in the show, and it was a home run at the Waldorf Astoria Hotel in New York, where ecstatic dealers took 500 orders in three days. The Mark VII evolved from the interim Mark V, which had looked like the pre-WWII Mark IV, except with long flowing separate fenders. Bentley had already used the name Mark VI, so Jaguar jumped to the next Roman numeral. 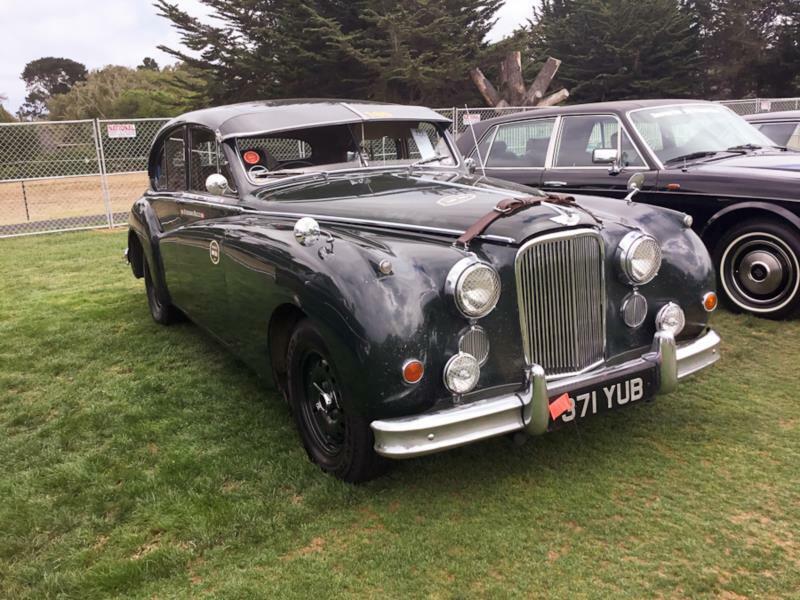 The body was now full-width, with slab sides and the suggestion of fender lines, but the Mark V roofline was retained and the grille also bore the same Jaguar signature. Inside, the burled walnut dash was crammed with gauges and the engine had been moved forward, which added three inches of leg space for the rear seat passengers. The new trunk also had a vertical spare wheel and was significantly larger. The Mark VII was able to cruise at 80 mph easily, especially when the optional overdrive gearbox becoming available in 1954. It sold well in the US, considering this was during the period of “export or die” for British industry. The Mark VII finalized 20,918 sales from 1950-54, and The Motor tested a Mark VII at a top speed of 101 mph and 0-60 mph in 13.7 seconds. Los Angeles dealer Peter Satori did even better, with 0-60 in 12.6 seconds and a top speed of 104 mph. The only major changes in the Mark VII occurred in September 1954 with the introduction of the Mark VIIM, of which 10,061 were sold in three years. The car gained bigger bumpers and taillights along with flashing turn signals. The engine was tweaked from 160 brake horsepower to 190, and performance slightly improved. A Borg-Warner automatic transmission was also an option. The Mark VII was followed by the Marks VIII and IX, with a curved windshield and two-tone paint, and then replaced by the enormous Mark X in 1961. As the Mark VII appealed to older conservative buyers, a number of good original cars still exist. The only real caveat is rust, but most rusty cars have long since been cannibalized for their drivetrains.